Ongoing trade tensions between the US and China as well as a softer global economic climate continue to weigh on the Japanese external sector. 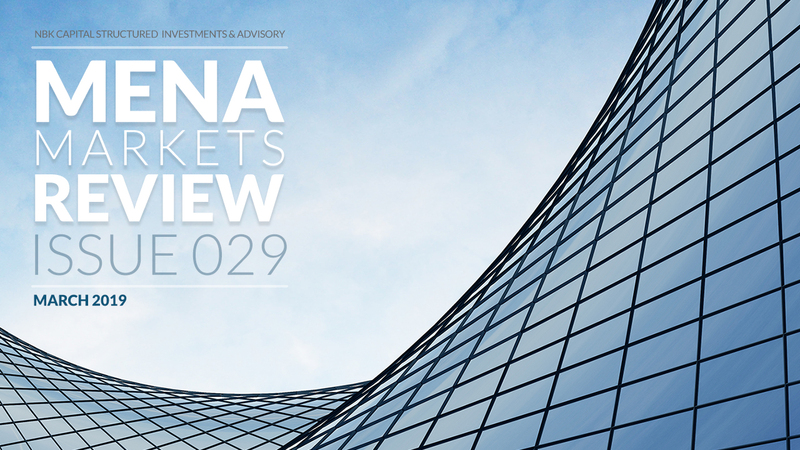 Equity markets continued to build on the positive performance since the beginning of the year and managed to end the first quarter of 2019 deep in positive territory. The MSCI AC World Index added another 1.0% in March for a Q1 return of 11.6%. Emerging markets also had a good month overall with the exception of Turkey which was down more than 10%. In the GCC, the effects of EM status upgrades and solid oil markets provided strong support which was reflected in a monthly return of 2.93% for S&P GCC Composite Index (9.6% YTD). Kuwait and Saudi led the pack with monthly returns of 7.4% for Kuwait and 3.85% for Saudi bringing their first quarter returns to 10.6% and 12.7% respectively. There has been more evidence of a worrying economic slowdown in the Eurozone, amid decelerating global growth, trade tensions, regional political uncertainty and the halt to monetary stimulus by the European Central Bank (ECB) late last year. The Eurozone flash composite PMI fell to 51.3 in March, pointing to just-positive growth but with the Q1 average significantly below 4Q18. Key to the downturn is weakness in the manufacturing component, which at 47.5 plunged deeper into contraction territory and to its lowest in six years, with Germany particularly affected. At the same time however, labor market data has continued to improve in most countries, with both unemployment (7.8%) and wage growth (2.3%) now at around decade bests. Although the labor market often lags developments in the rest of the economy, there is hope that this tightening will feed through into stronger consumption to cushion the region from a deeper industrial-led downturn. Meanwhile Eurozone inflation continues to trend lower, with the headline rate edging down to 1.4% y/y in March from 1.5% in February, while the core rate fell to just 0.8%. Both are well below the ECB’s goal of “below but close to 2%”. The bank revised down both its growth (1.1% from 1.7% in December) and inflation (1.2% from 1.6%) forecasts for 2019 in March, and now projects that inflation will remain below target through 2021. Like the Fed, it has abruptly changed course recently and after having ended its asset purchase stimulus program in December, has now restarted a program of offering cheap long-term loans to banks to boost credit and promised to not raise interest rates until at least next year – around six months longer than previously stated. However, with a possibility of a rate cut later this year by the Fed now being debated, talk of even a delayed rate hike by the ECB is beginning to sound outdated. International benchmark Brent crude closed out March with its best quarterly performance since 2009, rising 27% to $68.4/bbl. Prices have been buoyed by signs that the market is tightening. Led by Saudi Arabia, which appears determined to drain excess supplies from the market, OPEC-11 compliance with targeted production cuts reached 106% in February, with production down 812 kb/d to 25.9 mb/d from its reference level of last September/October. Non-OPEC compliance, meanwhile, improved to 52% in February from 25% in January. Russia reiterated that it intends to fully comply soon. OPEC-11’s efforts have been augmented by falling output from Iran and Venezuela due to a combination of political turmoil, mismanagement and US sanctions as well as by lower supplies from Canada and Libya. Even in the US, data has been less bullish of late. While US crude production continues to break new ground, reaching 12.1 mb/d in the week-ending 22 March, the number of oil drilling rigs has fallen for six consecutive weeks. Indeed, in early March the US Energy Information Administration cut its oil production forecasts, by 110 kb/d to 12.3 mb/d in 2019 and by 170 kb/d to 13.03 mb/d in 2020. Drilling in the smaller shale plays has become more circumspect amid a focus on shareholder returns.